October 2013 – The Malish Corporation, a global leader in the manufacturing and marketing of rotary/disc brushes for commercial floor cleaning machines, announced today it will showcase its unique line of Color-Coded Grit Brushes and other sanitary brush products at ISSA/INTERCLEAN 2013 at the Las Vegas Convention Center, November 19-21, 2013. 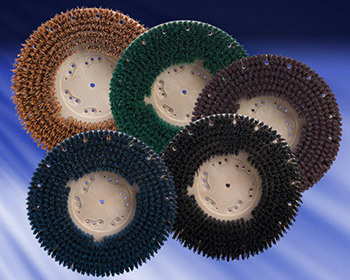 The Color-Coded grit brushes offer a wide range of cleaning solutions at an unmatched value and are well-suited for companies seeking a cost-competitive and customized green solution. Malish provides a comprehensive range of products and services that meet or exceed the highest sanitation requirements. The Malish Corporation will also be introducing its 2014 product catalogs. For more information about Malish products and programs visit booth #2079, call 1-800-321-7044 or go to www.Malish.com. Founded in 1948, The Malish Corporation specializes in the manufacturing of rotary brushes, rotary brush accessories, hand maintenance brushes, and the Diamabrush By Malish Floor Preparation System. The company is also a custom extruder of thermoplastic tubes and profiles. Headquartered in Willoughby, Ohio, The Malish Corporation operates manufacturing facilities in North America and Asia as well as a sales & distribution center in Europe. With a reputation for quality, engineering, testing and integration, The Malish Corporation provides every customer with personalized business solutions.